I have over this last week been continuing to copy out the poetry of Herbert Kingsford into an electronic form so that I can create an eBook of it before the year is out, I’ve managed to copy over 40 more pages of his poetry since Monday and my fingers hurt a little now. So, in an attempt to spread some of his work before I have quite finished producing a complete copy, here is one poem from his works that I hope, humble reader, you may enjoy as much as I do. Ere sails his ship for that far distant shore. Striving to keep his carcase in high health. And all this sin stained toil for six short feet of earth. And that is one of many, dearest reader, I pray that may have interested you enough to pay some interest at a time when I may gladly present you my humble attempt at spreading his work. May I humbly present to you certain thoughts and considerations recently brought forth by a doodle, and, as I have begun to wonder, my fear that this blog-like attempt at putting an order to words has simply become one massive thought-doodle. Dearest reader – I warn you the following may be annoying or pretentious, and I pray that future articles will not follow the suit of this one. A few weeks ago I was rebinding an old 18th century school book, which, in the year 1800, had become property of a young boy who clearly was easily distracted from work, since it is filled with doodles from front to back. Now, unremarkable you might say, what interest are some old doodles? Well, aside from all the fascinating social history surrounding the clothes and other things that are drawn, it shows a fascinating point about how little doodles change over time. You could look at a doodle in that schoolbook and see so very little difference to doodles being made today, including some that are not too innumerable among my own lecture notes! It almost shocked me seeing cartoon eyes staring back at me that had been drawn out of boredom in a lesson two-hundred years ago sat next to my own notebooks with the same cartoon eyes and faces drawn by my self. I would like to say I could tell you that whoever it was who owned that book grew up and became important and successful, but I have had no luck finding out much more about him than his name and when he was at school. However, it does make me think what is it about the age-old doodle that has always entertained us? Now, firstly, there is a key difference between doodling and graffiti-ing; the latter is something done on someone else’s property, often something seen as greater or more powerful, and the graffiti is to either demean that thing, or to show that the graffiti-er was there and that they existed too. Now, doodling is much more personal and doesn’t often have much interest other than to take up time that would otherwise be passed in boredom, and it is often there that whichever things interest or entertain the person doodling appear in doodle form. The boy doodling two-hundred years ago drew a large image of a man at the back of the book, and the use of different inks suggests it was drawn over at least a few different days. The style of the cartoon is clearly to make the man look ridiculous, and I like to imagine it is a picture of his teacher, drawn at whichever moments he had when the man wasn’t looking. Also, this interesting almost-related article I read some time ago considers a similar angle upon graffiti. I thought I might present a small work of poetry I finished a week ago today, and one that I recently read at a poetry reading. Though not perfect, it is based on a note that was written in a prayer book in Singapore in 1853, by a young woman called Maria Woher. The book itself is full of small and fascinating reflections left by her and I just happened to come by it for a few pounds just about a year ago. This one note is five words that, out of all the sad notes that fill it, is a small and simple point of hope that stands out. It simply says; Heaven is paved with love. Inspired by a note written in Singapore, one hundred and fifty years ago. To where the wheat crops lie. That rose up all alone. To beat their golden hue. As far as one could see. When all is young and bright. So quick, all hope has shone. Where low the wet rocks lie. A new day for us all. Dear Heaven’s paved with love. Also, Dan is now on ebay. I do appologise for my lack of recent posts, I’ve been very busy recently and have only just had a moment to sit down and avoid doing other important things that will now have to wait until tomorrow. Yes, worthy reader, have no fear, for I can indeed promise that my continued lack of sense is not gone, it is still lingering, as ever, in the inate wording of this humble blog, where there are more commas than braincells, and less facts than a fax machine. So, perhaps, dear reader, and indeed I hope, that you are right now screaming at your screen asking what has happened and did it involve ice cream. Well, you are kind to ask, for, as I myself put it, yes, yes and tasty. 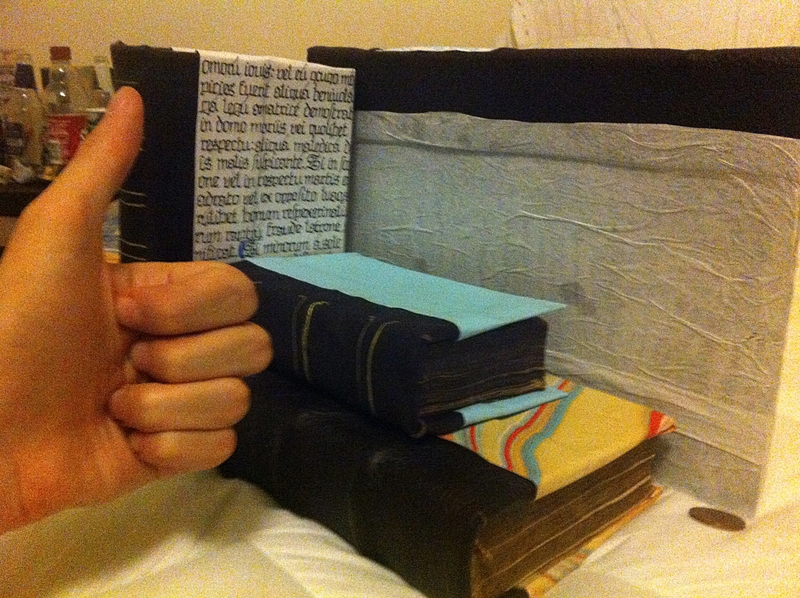 Well, I have been busy as always book binding. Ignore the amazing collection of things my hand is trying to obscure. I’ve also been busy reading and writing poetry, (Michael Oaktree by Alfred Noyes isn’t a bad one if you’re looking for something new to read). I’ve also filled up half a page of my sketch book, which isn’t even a finished half a page. And done a lot of sleeping.